The Day the Music Died: 59 Years Ago on February 3, 1959. The day that Buddy Holly, considered by many to be the father of rock and roll, died in a 1959 plane crash at age 22 along with Richie Valens and The Big Bopper. The “Not Fade Away” show is an authentic and energetic tribute to these three pioneers of Rock ‘n’ Roll and their infamous Winter Dance Party. This is not your typical tribute show. The band brings us back to the days of swoonin’, boppin’ and rockin’! with fresh new takes on classic hit songs including That’ll Be The Day, Peggy Sue, Everyday, Summertime Blues, Oh Donna, La Bamba, Chantilly Lace, Beggar to a King, and Twist and Shout. 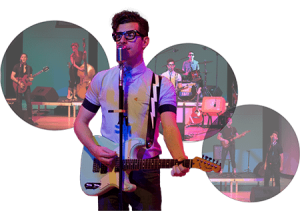 Fade Away take us on a fun journey down memory lane through the music of an era that lives on, including the hits of Bill Haley, Roy Orbison, Jerry Lee Lewis and Elvis. This popular show has got rave reviews on the road. 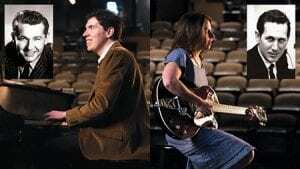 Pioneer pianist Floyd Cramer and guitarist Chet Atkins’ names are synonymous with the “Nashville Sound.” Their legacy lives on through Floyd’s grandson, Jason Coleman, and Chet’s niece, Meagan Taylor. They perform the iconic country and pop hits from this era, along with a captivating multimedia presentation and storytelling. Pop/Country Music Tribute. Appearing with the Camden Fairview High School Choir. This will be Jason Coleman’s third return to the Camden Community Concert stage – a super popular performer. Beginning with the third concert of the 2018-2019 Concert Season, the Ouachita County Community Concert Association is offering an annual “Arkansas Roots Concert” featuring a performing artist born in or growing up in the Natural State. We have lots of native talent who call Arkansas their home. Performers such as Kris Allen of American Idol fame, Gretha Boston, Elton Britt, Jim Ed Brown, Ed Bruce, Sonny Burgess, Camden’s own Michael Burks, Glenn Campbell, Johnny Cash, Floyd Cramer and so many more. Our first Arkansas Roots performer will be the Blane Howard Band. Blane’s wife is a Camden native and he has found his way back many times to South Arkansas to delight audiences with his high energy. He describes his unique style of country as “modern-traditional,” mixing the authenticity of the 90’s with the contemporary edge of today! A country music artist and songwriter, he now makes his home in Nashville. 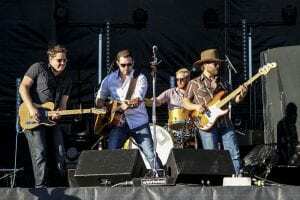 Known for their sibling harmonies and high-energy show, two-time Canadian Country Music Award nominees, Twin Kennedy, are a Canadian country sensation. 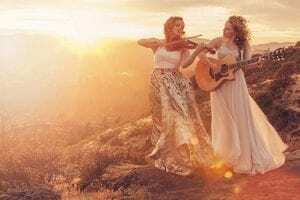 Carli on the guitar and Julie on the fiddle blend their classical training with their country roots to create a program enjoyed by all ages. Classical to Country!